His parents were set against it. Both the Matriarch Apostolic Oracle and the Reverend Bishop Judge Advocate urged their only son to reconsider. His tutors pleaded with him. His fellow cleric Faith boys at Temple-at-Attica thought him humor-struck or fever-sick. But Constantine tauValez knew his own mind and was determined to live his life his way. Constantine had been born into Faith, to parents accomplished, respected and well bred. A gift for scholarship and a keen intellect were apparent even as a child. Constantine was blessed a prodigy. 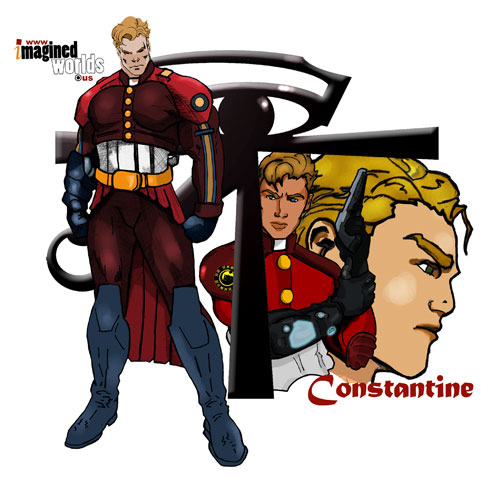 At an early age his parents set Constantine on a track toward position and authority. His Faithful tutors saw the potential to rise as far as the Principalities, or even the Seraphim. However, by the time Constantine reached thirteen and inducted into the Disciple of Michael, other ideas begun to preoccupy him. Constantine wearied of life behind monastic walls, of the isolation of academia, and of the pretensions of privilege. A student of history, the romance of Faithâ€™s warrior priests in ancient timesâ€”the so-called Soldiers of Paradiseâ€”enthralled the adolescent. The old stories of swordsmen on gryphon-back riding the open countryside and enforcing the will of Faith struck a cord. He daydreamed of a life of adventure and intrigue, and of service to Faith that would take him far away from the sanctimonious world heâ€™d grown up in. Against all better judgment, Michael Constantine tauValez enlisted in the Order of the Knights Templar.